This page covers advantages and disadvantages of Parabolic Reflector Antenna. It mentions Parabolic Reflector Antenna advantages or benefits and Parabolic Reflector Antenna disadvantages or drawbacks. What is Parabolic Reflector Antenna? In is one of the most common type of microwave antenna. It is composed on parabolic dish along with antenna feed. The various arrangements are used as feed for the parabolic reflector antenna. It include center feed with spherical cell, center feed with horn antenna, cassegrain feed etc. This antenna type is used both as transmitter and as receiver. The figure-1 depicts working principle of parabolic reflector as transmitter. As shown feed radiates power into reflecting surface having parabolic shape. The reflector reflects microwave power along the antenna axis which is direction of the beam. Similarly waves falling on the dish are concentrated towards the feed placed at focal point of the dish. This ways reception is carried out by the parabolic reflector antenna. Refer Antenna Reflector basics and types>>. ➨It can be used both as transmitting antenna and receiving antenna due to principle of reciprocity. ➨The feed can be used in various modes with parabolic reflector viz. centre feed, cassegrain feed or offset feed. Each of these configurations have their respective benefits and applications. ➨Feed antenna and reflector disc block certain amount of radiation from the main parabolic reflector antenna. This is about 1 to 2%. ➨The design of parabolic reflector is a complex process. 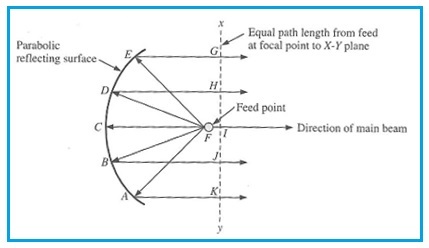 ➨Inspite of feed horn at focus and uniform illumination, certain amount of power from feed is bound to slop over the edges of parabolic reflector. This power is responsible to form side lobes in the radiation pattern. ➨Surface distortions can occur in very large dish. This is reduced by using wide mesh instead of continuous surface. ➨In order to achieve best performance results, feed should be placed exactly at the focus of the parabolic reflector antenna. This is difficult to achieve practically.